Been a while since I posted. Moved to a new state last April, took a few months to settle in, and now have been working on my motorcycle project mostly. However, spring is coming, and I want to give some TLC to my PT. Can anyone recommend direct replacement speakers (both front door speakers, both tweeters in the dash, and both rear speakers) for my 2002 PT Limited Edition? I want something that will screw right in and give me good sound. I am using the stock PT radio/casette/AM-FM radio. No, I do not want to change out the radio. No, I do not want to install a power amp, or bass cabinet. I just want direct replacement speakers that will give me decent sound. Sorry, I haven't done a search for previous posts on the subject. I figured I'd just ask and start a new conversation. Pioneer DEH-X9600BT head unit, B² Rage 1200.6 Amp, 4 JBL GX963 6x9's, 2 Skar VVX3-12's. IT'S LOUD!!! Hiya Chuzz. Unfortunately, Crutchfield has no direct replacement for my car. Did you need to do any mods to mount there or were they a direct mount? Also, what are the square "boxes" that come with the tweeters? I see plenty listed for an 02. Except the tweeters, but I bet they do have them. In my '03 Limited, I have 6.5 Crunch component mid-woofers in the door. They fit with no extra work at all once you buy the adapters. Instead of using the included component 1" tweeters, which would have required an adapter to install in the dash location, I decided to buy some 3.5" Crunch 2-way coaxial speakers. All due to me not wanting to do any cutting in the door panel for the component tweeters and also, I was simply unable to find any adapters to install the component tweeters in the dash location. I also used the included component crossover to run the 3.5" as de-facto tweeters. So this was actually, for me at least, the easier way to upgrade. The dash installation was a bit tricky though, since I needed to widen the speaker opening by shaving some plastic to make the 3.5" speakers fit correctly. A dremel does this easy enough but the plastic shavings are a pain to clean out from behind and inside the dash. Once I shaved enough, they drop in smoothly and I can even use the OE screw holes too. The only noticeable (not very though) is the dash cover is slightly raised in the area over the speakers due to the coaxial tweeters. Not a big deal since apparently I'm the only that has noticed that "bump". I was considering going back and widening the space just a little more to make the installation more flush, but decided against it due to it being such a minor imperfection. BTW, I did this installation over a year ago and am still seeing plastic shavings whenever I take out my floormats to clean. So beware. Everything can be found and bought on eBay (of course right? ), except the 3.5" coaxials which for some reason are rare and over-priced there. I bought those online at Sonic Electronix. Might be able to find the 3.5" on eBay for less than $20 if your timing is lucky though. The sound was an amazing difference from stock and the highs off the windshield are noticeably apparent. 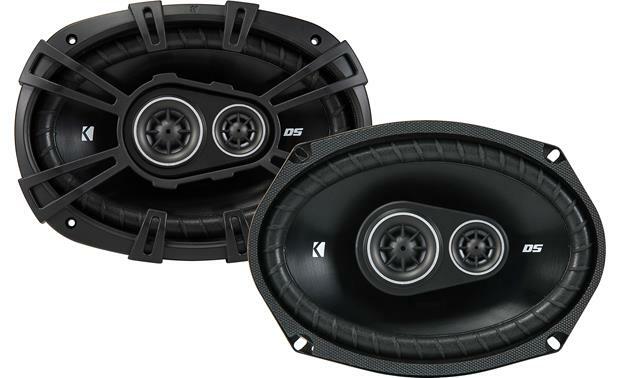 I was thinking of using a similar setup for the rear speakers since there I have 5x7" Crunch 2-ways running straight forward and still have the extra pair of tweeters. So far I'm happy with those speakers as is so not fiddling with them - for now. I'm sure you will, if not already, figure out your own setup.